LTG Scott Miller will be the next Resolute Support commander in Afghanistan. According to a news report by The Wall Street Journal he will soon head to Afghanistan. He is currently, as a Lieutenant General, commanding the Joint Special Operations Command (JSOC) located at Fort Bragg, North Carolina. He has been in that position for the past two years. He has been nominated for promotion to General (4 stars) and will replace General John Nicholson who is the current commander of NATO’s Resolute Support Mission and US Forces Afghanistan (USFOR-A). LTG Scott Miller has some experience in Afghanistan. In 2010-2011 he was the commander (BG) of Combined Forces Special Operations Component Command – Afghanistan (CFSOCC-A). At that time it was a one-star position. His command was heavily committed to the Village Stability Operations (VSO) program and the training and advising of the Afghan Local Police (ALP). 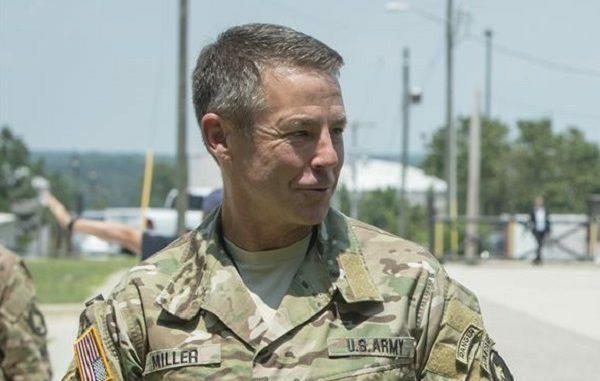 Miller would later return to Afghanistan to lead NSOCC-A / SOJTF-A for a year (2013-2014). This time as a Major General. The organization had been elevated to a two-star command taking under its control the ‘NATO SOF’ and ‘Task Force’ organizations – combining all SOF components operating in Afghanistan under one command. In addition to his command time in Afghanistan he served as the director of the Pakistan-Afghanistan Coordination Center on the Joint Staff in Washington, D.C. He is a well-rounded officer with combat tours in Somalia, Afghanistan, and Iraq; as well as serving in assignments in other overseas locations to include Bosnia and Latin America. He took part in the ‘Battle of Mogadishu’ in 1993 when he was a captain serving with Delta Force. Miller spent some time at Fort Benning as the commander of the U.S. Army Maneuver Center of Excellence. Fort Benning is the home of the Infantry and several Army schools to include Ranger School, Airborne School, Pathfinder School as well as the officer and enlisted professional development courses. After his tour at Fort Benning he would move north to Fort Bragg for his JSOC command. Miller started his career at the United States Military Academy at West Point where he graduated in 1983. He became an Infantry Officer with assignments with the 82nd Airborne Division, 2nd Infantry Division, 75th Ranger Regiment, and United States Army Special Operations Command. LTG Austin “Scott” Miller has to pass muster with the U.S. Senate – he will soon go before that body for Senate confirmation..
LTG Scott Miller faces a difficult task in Afghanistan. While the Afghan National Defense and Security Forces (ANDSF) has improved in their capability it has not been able to defeat the insurgency in the field. The Afghan SOF have achieved ‘tactical victories’ but the Taliban now control more of the rural countryside and population than at any other time since the Taliban regime was overthrown in the fall of 2001 – 17 years ago. Miller is undoubtedly one of the best choices the U.S. military has to lead the U.S. and NATO forces in Afghanistan. Photo: LTG Scott Miller is pictured in this photo while at Fort Bragg during his command of JSOC. Photo by Air Force Tech. Sgt. Brigitte N. Brantley, USAF, July 27, 2016.